So What’s The Deal With Housing Reselection? At this point, you have hopefully received an email with your housing re-selection information. Here are 5 things you should know to set yourself up for success in your second year! 1. Housing contracts are due by 11:59 p.m. on March 3, 2017. Make sure yours is in on time! 2. Housing is being done by a lottery system this year! This means once the portal closes on March 3rd, you will be assigned a random number to determine the order you will select your room. No need to stress about this–everyone has an equal chance to select their room! 3. Roommates: Whether you absolutely loved your roommate(s) this year or not, with the housing re-selection process comes the time to figure out who you want to live with next year. I have my perfect roommate! What do I do? In the housing re-selection portal you can request one roommate. The roommate request must be mutual–which means they will accept and approve the roommate request. I want to live with 7 of my friends! What do I do? If you want to live with a group, during the re-selection process you will form a “group” and select one person to be the group leader who will assign you into rooms once your lottery number is reached. I have no idea who I want to live with! That’s ok! The best piece of advice I was given regarding roommates was that, “you don’t have to be best friends with your roommate, you just have to be roommates.” Sometimes best friends won’t actually make the best roommates (sometimes they do though!). Also, if you decide you don’t want to have a roommate next year you will also be able to request a single room in the housing re-selection portal. 4. STEP: The Second-Year Transformational Experience Program (STEP) was definitely one of the highlights of my second year. 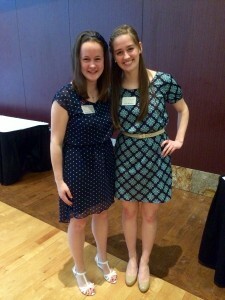 Personally, my favorite parts about STEP were getting to know a really awesome professor on an individual basis, getting to know the other 2nd years in my cohort (and hear about all the amazing things they were doing), and completing my Signature Project (through which I actually got to go to Costa Rica!). Had I not participated in STEP, I wouldn’t have that great connection with my STEP faculty mentor nor would I have had the opportunity to travel to Costa Rica (which definitely was a life-changing experience for me!). When you fill out your second year housing re-selection contract, there will be a checkbox for you to opt out of STEP. More questions? Check out the STEP website or talk to your Peer Leader! 5. Food! Did you know that as a second year you will have an additional option for a dining plan? Check out the dining website or the chart below to decide which meal plan is right for you for your second year! If your current meal plan is working for you, you can just go ahead and select it again for your second year (makes life easy, right?). Lucky for you, if you change your mind, you can change your meal plan until the 2nd Friday of next semester. Best Friends or Roommates: Same Thing? It’s that time of year: time to decide who you will spend the entirety of next year sharing your precious personal space with and calling your roommate. For some, the decision may come easy. But for many, the decision feels dreadful. Day in and day out I see friends posting Buzzfeed articles on Facebook entitled, “20 Reasons How You Know Your Roommate is Your Best Friend” or “8 Reasons Why Living with Your Best Friend is the Greatest Thing Ever.” Living with your best friend could be a great decision. But I have also seen the opposite be true; many friendships fall apart after deciding to live together. Some people, regardless of how close of a relationship, will not make good roommates and that is okay! As it comes time to make your decision, I recommend having an honest conversation with your potential roommate about living preferences. What matters is that you will be good roommates and do not necessarily have to be best friends. Two years ago I struggled immensely with the decision of who would be my sophomore year roommate. There were at least four different contenders, and I was closer with some than others. However, I ultimately decided to live with a friend that I was not nearly as close with (at the time) but I knew for a fact we would be phenomenal roommates. We lived next door to each other during our first year, and it was very clear when you walked into either room which desks were ours based on the level of organization and cleanliness. Also, I knew I would feel comfortable talking with her if an issue were ever to arise (which fortunately didn’t end up happening!). While some may not believe me, I can honestly say I don’t think we had a single disagreement all year. Being able to come home at the end of a long day to a room that I knew would be clean and drama free was a major reason I found my groove during my second year. Living with a fellow introvert, I knew that I could come home and just stick headphones in if I needed alone time. She wouldn’t misunderstand my need for quiet, thinking I was mad or upset. She recognized that we both sometimes just needed quiet time and that was not a reflection on her. Other days, we had great times together just hanging out and being silly. It was through this mutual respect and understanding, that we became great friends over the course of the year and ended up traveling across the United States together. I am so thankful that I picked my roommate based on someone who I knew would make a compatible roommate because that created the foundation for a wonderful friendship. While I was fortunate to have made a great decision, some of my other friends found their friendships deteriorate because living with a best friend ended up being harder than they thought. I was so thankful day after day that I could confidently say that I had such a stress-free living environment. After all, there are plenty of other stresses that come with being a college student. Do you want to add the stress of incessant roommate disagreements and arguments? Think through your preferences and communicate with your potential roommate before you sign the housing contact. Don’t forget to submit your housing and roommate preferences by Feb. 26! Sharing a confined space with another living, breathing creature–and I’m not talking about your fish or body pillow–can be difficult. In my first year, I was challenged going from my own room at home with a bed big enough for my entire graduating class to a room half that size and a bed that was barely big enough for my Brutus pillow pet and me. Add three more people–strangers–to that space and life has never been the same. Those roommates I was forced to share bunk beds with turned out to be some of my best friends, but that isn’t always the case. There are few things in life you have to be selfish about, but housing may be one of those things. Whether you are living in a cave, your parent’s basement after graduation (oh no! ), or the 37th floor of the Empire State building, that is YOUR home. When it comes to deciding where to live and who to live with, make sure you are comfortable and can come to consensus with your roommate(s). The last thing you want is to spend a year of your life unhappy trying to please someone else. Never agree to live with someone or somewhere out of guilt. Those tough conversations are hard to have, but you will be much happier in the long run…trust me. Best friends are not the best roommates and roommates do not have to be your best friends. Because of what we see in pop culture, we often come to college with an unrealistic expectation that our roommates are going to be our best friends and we will all live happily ever after drinking hot chocolate and having pillow fights every night until 2 a.m. When this turns out to not be the case, the perfect vision we created in our heads of college is no longer and we start to compare our experience to others. The best roommates are simply people who have compatible living habits. You do not need to be best friends; you simply need to get along. In fact, you may want to also consider not rooming with your best friends, simply to protect your friendship. Although they may be a great companion, they may have living habits that get under your skin. Find that perfect balance between good friend and compatible living habits, and you have the perfect match! The Golden Rule: treat your roommate how you want to be treated. If you do not like to come home to passive-aggressive Post-It notes, do not leave them for your roommate. If you do not like moldy food in your living quarters, store your leftover taco salad in the fridge. If you like to go to bed by midnight, study at the library or down the hall in a common area when you roommate wants to sleep. Chances are that the small things that get under your skin get under your roommates skin as well. Don’t do anything to your room or your roommate that you would not want them to do to your room or you. Address a situation when it arises. If you find that your roommate is violating the roommate contract or doing something that you do not appreciate, address the situation as soon as possible in a face-to-face conversation. The sooner you address the situation, the better things will become. Gossiping with your friends down the hallway will not make the problem go away. The last thing you want is to build up anger or frustration toward them for something they may not even realize they are doing. These conversations may be hard to have in the moment, but can have positive impacts on the roommate relationship in the long run. Share the snacks that Mom sends. This is mega important for your friendship, especially when Rice Krispies treats are involved. Deciding to go random for my roommate(s) was one of the best decisions I ever made and I do not know if our Ohio State paths would have crossed if it were not for the lovely housing office that put us together. As you can see, living with another person is hard. A lot of the time it takes patience and every once in a while a hard conversation, but by keeping these rules in mind, you are bound to have a great year! I lived in Smith-Steeb my freshman year, so I had it pretty good. Super nice rooms, full service on-campus food options very close by, and an unlimited number of people to turn to if I needed help or advice. Don’t get me wrong, I love living off campus and I love my house now, but there are definitely times when living in the dorms seemed so much simpler. When you live in a dorm, you pay a lump sum at the beginning of the semester to cover all of your food and housing fees, and that’s that. When you live off campus, you have to pay bills! It sounds crazy and way too adult-like, but it’s true. Bills are definitely the worst part of living off campus. Now that you’re responsible every month not only for rent, but for gas, electric, cable/Internet and water, you need to be way better about managing your money and learning to budget. Here are some apps to help you. Having to go grocery shopping and cook meals is also a big adjustment when moving off campus. You no longer have access to pre-made food whenever you want it (unless you get a commuter meal plan). Doing your own grocery shopping seems great — you’re able to buy whatever food you want without your mom there to say no, but it’s really important that you are actually getting everything you need to maintain a healthy diet. Also, it is important to get things you know you can cook, and will actually eat. Here are some easy recipes to get you started. The last thing I think is really important to consider before you move into your off-campus apartment or house in the fall is your relationship with your roommates. I got lucky. I met my current roommates on Facebook, when we all just needed a place to live, and now they are four of my best friends. If you are living with people who are already your friends, it is important to work hard to keep that relationship in tact. Whether it’s about whose turn it is to vacuum the living room or who didn’t empty the dishwasher, there will be arguments in your home. It’s not always easy living harmoniously with several different people on different schedules. But I can promise you, if you put in the effort to keep a happy environment in your house, it will definitely be worth it! A little work goes a long way, so it is important to just remember to pick up after yourself and remember that you don’t have any parents to clean up after you anymore. Living off campus with four roommates has been the best experience I could have asked for. This article isn’t meant to scare anyone away! Just remember that with moving off campus comes a lot of independence, and you have to be prepared to seize it and make the most of it! One last tip: buying a house pet is going to seem like the best idea you’ve ever had. Chances are, it’s not. Pets are a HUGE responsibility, so make sure you do all research necessary on the care for an animal, and make sure you talk to your landlord to see if pets are even allowed. Think before you adopt! November, like every other month, is an exciting time at Ohio State. Between the semester starting to wrap up, Beat Michigan Week, and Thanksgiving, there’s plenty to do this month on and off campus. Something else that’s exciting, but can also be incredibly stressful, is figuring out where you want to live next year. Well anonymous voice, the good news is that if you’re choosing to return to campus and live in a residence hall again, your housing contract isn’t even issued until second semester, so you have plenty of time to decide on specifics. However, if you want to live off campus, now is the time to start looking for housing. Most rental companies are already giving tours and signing leases, so it’s in your best interest to get started now. After all, you want plenty of options when looking for your dream apartment! Here are five essentials to keep in mind as you begin your off-campus search. To many, price is the most important criterion when looking for an apartment or house. After all, college isn’t cheap, and housing is one of the most expensive things you’ll spend your money on besides tuition. Most leasing companies allow you to search properties by cost on their website, so determine the amount you’re willing to spend every month and begin your search from there. Remember, most landlords are going to ask you to sign a lease for a full year going through the summer, so take into account an extra three months rent if you’re going to move back home. Also, don’t forget about the less obvious fees such as monthly utilities and furnishing your apartment. There are plenty of options in terms of location depending on what is most convenient for you. If you’re a business major, consider staying north so you don’t have to walk too far to get to your classes. If being close to the Chipotle on High Street is a deal-breaker, think about staying closer to south campus. There are even rental locations far away from campus that are available if you don’t mind driving in or taking the bus every day! If you decide to go that route, factor in the cost of a parking pass if you plan to drive to campus. 3. Don’t Forget About Laundry! 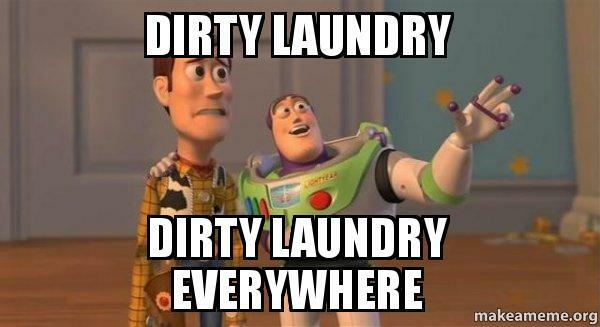 As a student in a residence hall, all it takes to do laundry is loading up your BuckID and walking down to the laundry room. However, it’s not always that simple when it comes to off-campus housing. When you look at a house, don’t forget to check whether or not there’s a laundry hookup, a common laundry area, or no laundry at all. Chances are you won’t want to have to walk or drive to a laundromat where you’re going to have to pay a higher rate than campus laundry for every load. 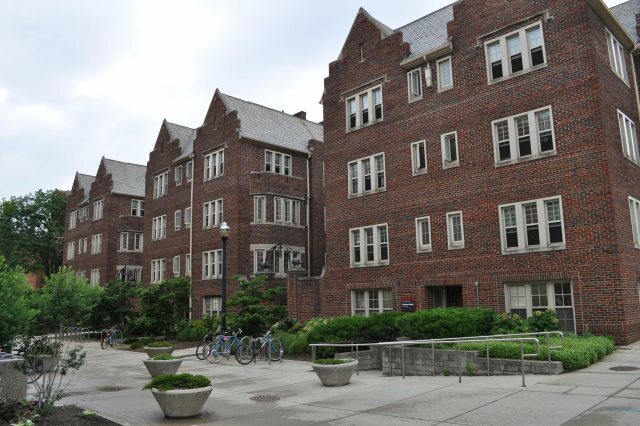 Every year, OSU’s Undergraduate Student Government publishes a Renter’s Guide that provides extensive data and reviews on most rental companies with properties near campus. The guide is based on student responses to questions on topics such as rental cost and how satisfied the student was with the property and landlord. This is undoubtedly the most reliable way to learn about different landlords in the area, and with it you can see a list to compare different realty companies. A lease is a legal contract, so once you sign it you’re obligated to follow it and are bound to its terms for the stated length. This is probably one of the first, if not the first, legal contract you’ve ever had to sign — so you want to be absolutely sure you understand and agree with everything listed, such as whether or not the landlord can increase your rent during the year you’re leasing and whether or not you have to buy something like renter’s insurance. OSU Student Legal Services staffs trained legal professionals who are here to help you, and chances are you already paid for their services in your yearly tuition. Don’t end up with a landlord like this! Every Ohio State student on who lives campus has an RA. These people ARE really awesome, but RA also stands for Resident Advisor. Exactly one year ago I had never considered being an RA. After two years of living in a residence hall, I was going to move off campus with my friends and leave dorm life behind. But as I started to think about the effect I could have on potential residents, even in the smallest way, I knew that being an RA could really change my college experience for the better. It has been one of the best decisions I’ve made at Ohio State, and I would encourage anyone who is even remotely interested to apply. 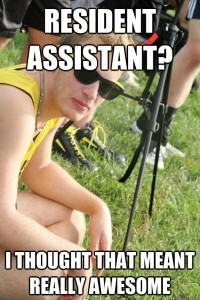 So you may be asking, “What does a day in the life look like for an RA?” Well let me tell you. 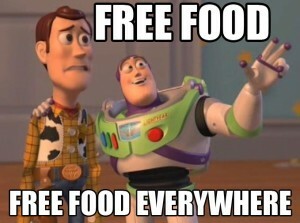 We bring residents to events around campus. 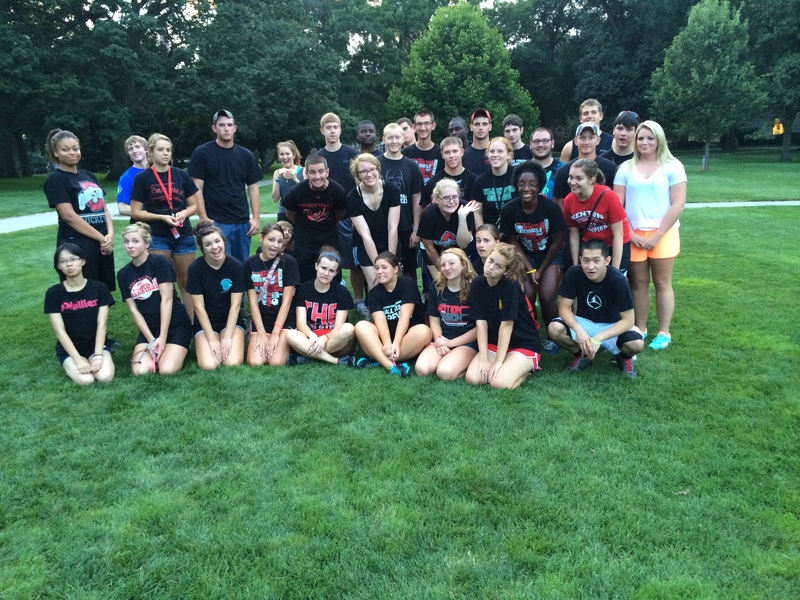 We plan programs within the residence hall (or on the Oval in this case). 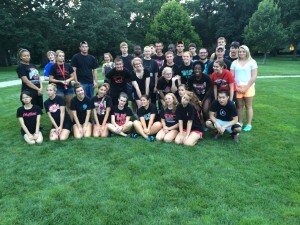 Our complex played Capture the Flag on the Oval during Welcome Week. We decorate the halls and build community within the residence hall. In addition to all this, we do rounds, discuss difficult issues with our residents, and work closely with our Hall Directors, Resident Managers, and other Resident Advisors. It’s a tough job, but it’s also really rewarding. Now you may be asking, “How do I apply for this Really Amazing position?” Not to fear — there are 3 easy steps! 2. Get references from people who know you well. 3. Write unique essays that explain why you want the job and why you think you would be good at it. And that’s it! My advice is to really think about why you want the position and how you think you can make a difference in the lives of your residents. You will be trained in every aspect of the job, but for now, if you have a passion for helping others and a good work ethic, this could be the perfect job for you. The application deadline is November 21 — now go get writing! Ready or not, it’s time to start packing (if you haven’t already)! Move-in day is just around the corner, and as the collection of soon-to-be-transported items turns into a mountain in the corner of your house, you may begin to wonder just what it will be like. Will I like my roommate? I hope my RA isn’t super weird. How do the laundry machines work again? As a third-year Resident Advisor (RA) I understand your apprehension, but have no fear! Stay calm and read on as I reveal the real story behind the Residence Life rumors you may have heard. My roommate and I were BEST friends. While your older sibling or friend may tell you this, that doesn’t guarantee that your experience will be the same. You might hit it off with your roomies, but in most cases they may not become your new BFF. That is more than okay! You don’t have to hang out every minute and share all of your thoughts and feelings in order to be good roommates. At the end of the day, having a successful relationship with your roommate(s) is all about communication and compromise. Sharing bathrooms is a nightmare. I’ll admit, sharing a bathroom is not an ideal situation, but you would be surprised how it helps you to build community and feel connected to others on your floor! Community bathrooms are cleaned every weekday by the housekeeping staff, and nothing bonds you with another like brushing your teeth together in the morning! It was so loud whenever I tried to nap or study. 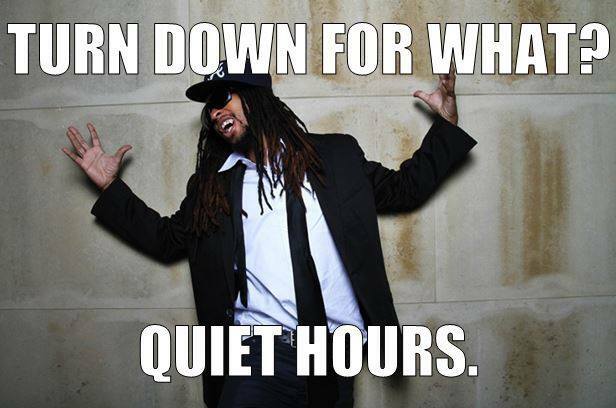 Every residence hall on campus has standard quiet hours from 9 p.m .to 7 a.m. on weekdays and 1 a.m. to 7 a.m. on weekends. That means that during this time, you must be quiet and respect others in your community or the RAs may document you for a noise violation. In addition, there are 24-hour courtesy hours, which means at any point in time you can ask a fellow resident to quiet down and they should be respectful of your request. 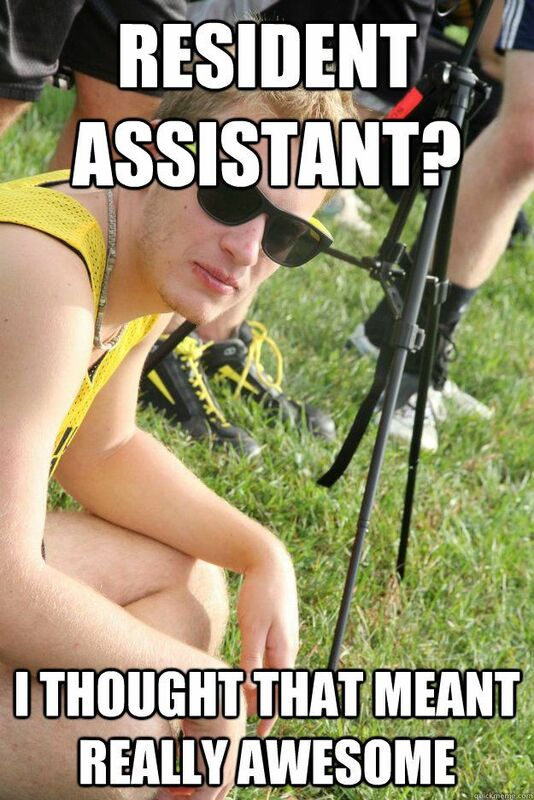 The RAs love to get residents in trouble. While documentation is an important part of every RAs job, I can say from experience that very few of us enjoy finding our residents in violation of the residence hall policies. It is a common misconception that RAs are the police of the building. The real story is quite the opposite. Most RAs take their job very seriously because they care about students and their success. 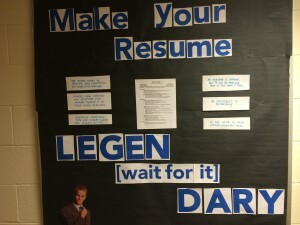 Your RA is likely a wonderful resource who can connect you to faculty, events and organizations on campus that will you help you grow academically and as an individual. 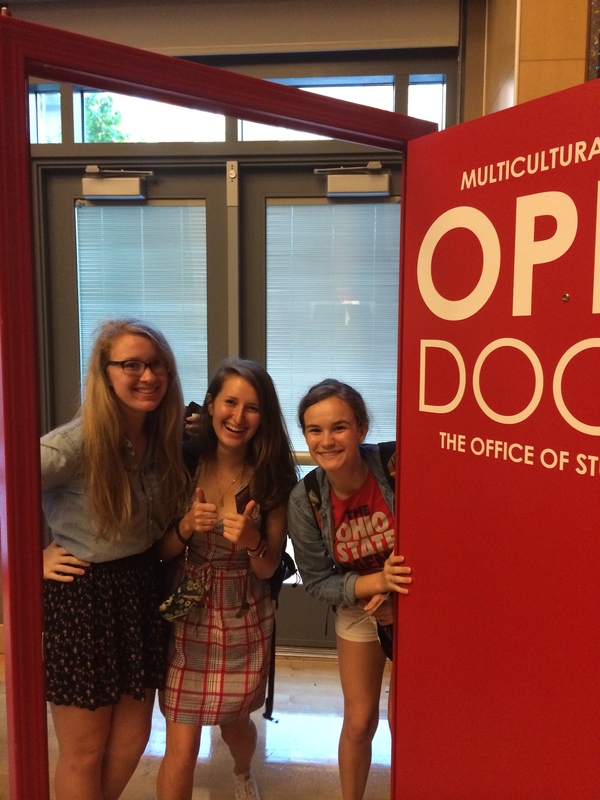 As you can tell, residence life is full of opportunities that will help you to enhance your Ohio State experience! While the list above highlights some of the myths you may have heard, it doesn’t scratch the surface on all of the amazing aspects of living on campus! 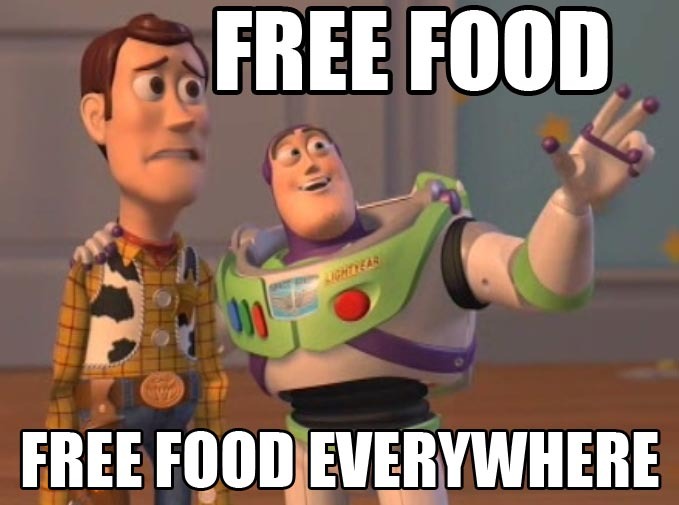 I encourage you to take advantage of the people, programming, support and free food (yes!) offered to you throughout this year, and to approach move-in day with excitement as you begin your journey at Ohio State. Connectedness to campus. When I was a second-year student at Ohio State circa 2008, I lived in an apartment East of High Street. Although I was a 7-minute walk from campus, I felt less connected to the campus. I was no longer surrounded by hundreds of other students like I was in my first-year residence hall. It took more effort to travel to and from campus for class. I hadn’t realized how living on campus is great for staying connected, making new friends, and maintaining a large support network in your home (residence hall). You can still do this when living off campus, it just takes more effort (i.e. get involved!). Safety. If you are unfamiliar with an off-campus area, check out the police crime reports for that area before signing a lease. 2) WHO will you live with? Perhaps by now you’ve figured out how to live with a roommate (if you live on campus). Yes, it can be stressful to share such tiny space with a stranger. You’re probably itching to have your own bedroom. Lucky for you, upperclassmen residence hall options often contain more space and amenities than a traditional first-year room. If you make the leap to live off campus, you will surely have more space. With more space comes more room for problems to arise. 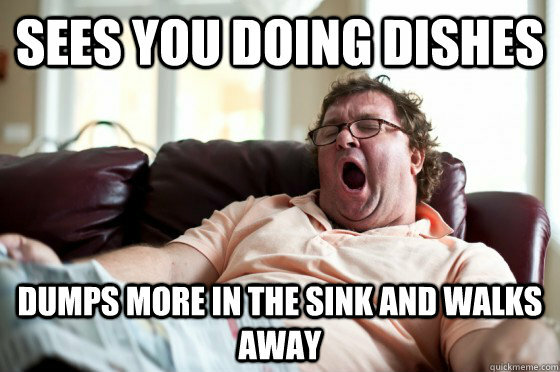 I speak from experience when I say that seeing your roommate’s 4-day-old dirty dishes in the sink will drive you crazy. Also, a disagreement on the location of toothpaste in the bathroom somehow becomes the fight of the century. Just because you move to a bigger place doesn’t mean the roommate problems will go away. They will continue, but you will improve your ability to solve them. The university can also help you find roommates. 3) HOW will you pay for housing? How MUCH will you pay? Residence hall expenses will be paid through your tuition and fees bill once per semester. Do you have the funds (whether it’s loans, aid, or pure money in da bank) to cover this twice a year? With off-campus living, you will have several bills to pay on a monthly basis: rent, electric and/or gas, cable/Internet, sometimes water and trash. You will likely need a checking account and reliable source of funds (i.e. money in da bank) to pay these expenses every month. Sure, living on campus is a bit pricey. But consider the many benefits (safety, proximity to classes, activities, sense of community, meal blocks) and decide if those benefits are worth the cost. 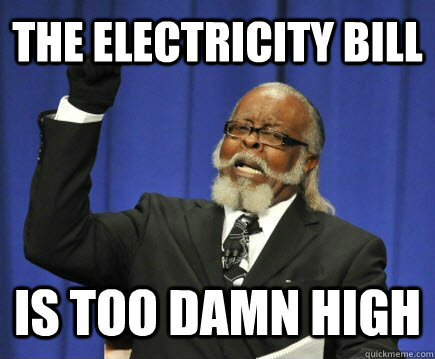 When living off campus, your utility bills will change with the seasons. Do your research about these off-campus living expenses. The words spoken by many Ohio State students after the Polar Vortex of January 2014. 4) WHEN will you live there? Pay attention to the move-in date (on-campus) or lease start date (off-campus). Consider any factors (e.g. summer job, fall commitments) that might affect your ability to move-in at the start date. While residence halls close in the summer, most off-campus leases include the summer months. Check your lease for policies regarding moving out and subleasing (if necessary). Living off campus means you must assume new responsibilities: cooking, cleaning, paying bills, and understanding the legal obligations of signing a lease. Learning to cook for yourself is a skill that’s perfected with time and experience. Heck, I’m 25 and I still set off the fire alarm in my apartment when I use the oven sometimes (#truestory). But living off campus or in a residence hall such as Neilwood Gables) will require you to use a kitchen. And seriously, that part about paying bills and legal stuff: signing a lease with your name means you are the adult responsible for the place you are living. University Housing contract renewals are available beginning Saturday, January 25th. Check your university email for more info. Consider joining the STEP program. Not sure what STEP is? Stay tuned for an upcoming blog post dedicated to the STEP experience. If you decide you’re living off campus, use offcampus.osu.edu as a starting point for finding a place. If you haven’t already started looking, do so ASAP – off-campus places in the University District will fill up fast. If you’ve already signed a lease, get your plans in order.